Before buying our home me and the hubby rented a flat for two years, a time I look back on fondly as it was the first place we lived together, just after getting engaged. Whilst the benefits of renting can be huge - a landlord on call should anything go wrong, the ability to move around easier, and often the chance to live somewhere you couldn't afford to buy (for me it was a city centre) - a downside is obviously being unable to redecorate, however there are other ways to leave your own stamp on a home. During our time living there we were saving like mad to buy our first home and get married (in hindsight, probably far too ambitious to be doing both at the same time! ), and I spent a lot of time and effort trying to make it more homely whilst on such a tight budget, so thought I'd share some of my tips. The main issue we struggled with was the fact that our flat came ready-furnished. Whilst practically this was very handy (and absolutely necessary for us, financially), I found that this made styling quite difficult - particularly as we were stuck with some rather unsightly bits (think a moth-eaten wicker coffee table and contrasting navy and red sofas!). 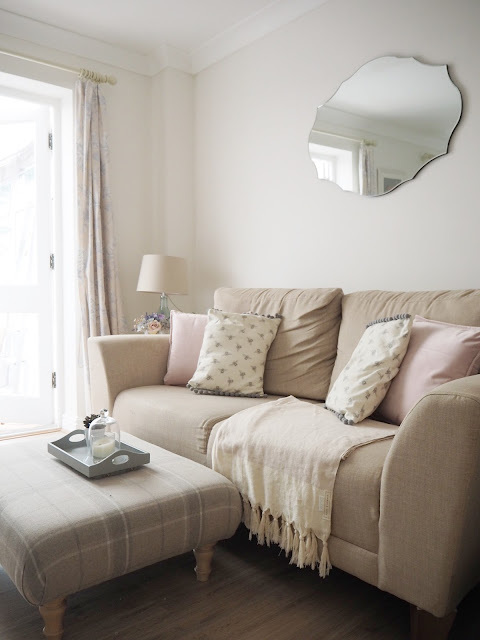 Using items such as cream throws over the sofas and complementary cushions and rugs can make a huge difference in transforming a room. A neutral coloured rug and some complementary cushions can tie everything together a bit more. My favourite part! I'm a huge fan of artificial flowers and think they can really finish off a space, creating a stylish and luxurious feel. My go-to are currently these bargain Eucalyptus stems, from Floralsilk.co.uk, which I absolutely love the look of in my bathroom. I also found this gorgeous faux succulent in Homesense. Candles obviously give a room a more cosy feel, as well as a beautiful smell, of course. 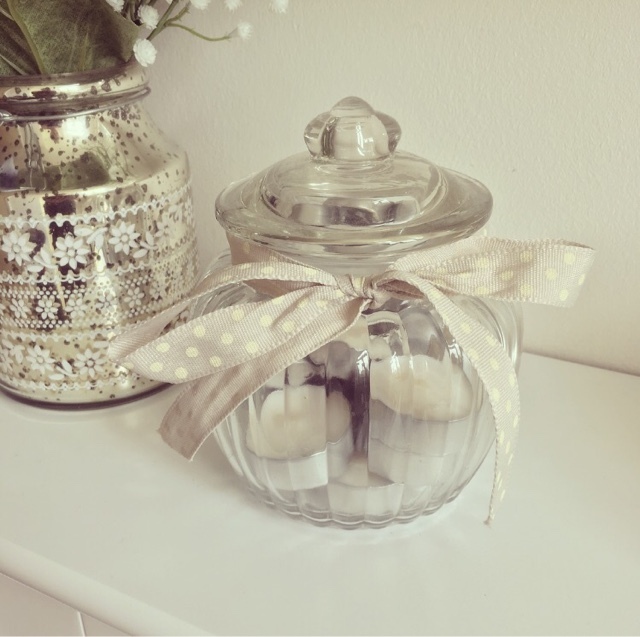 White cotton tea lights from Wilko were my favourites while we lived there - £1.50 for a pack of 30! I stored them (and still do) in an old jar which I tied a ribbon round. 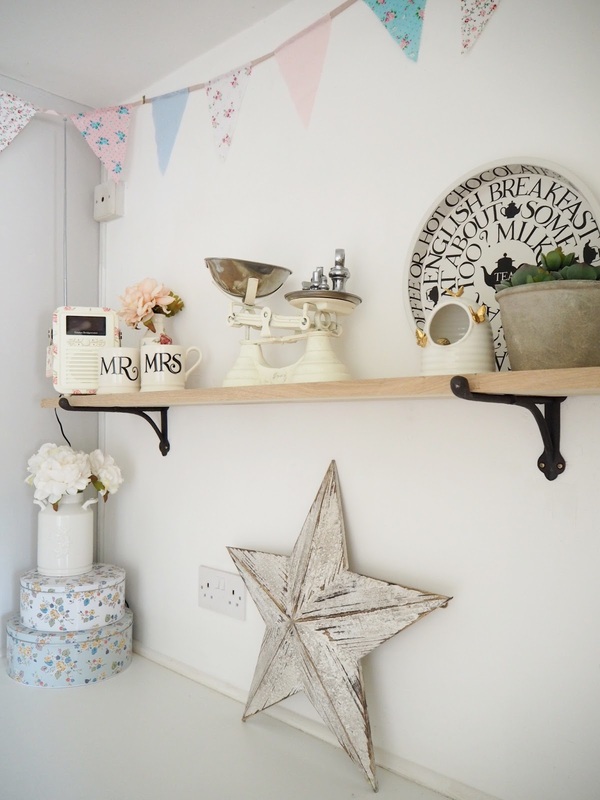 In my kitchen I use country-style accessories such as storing pasta in a jar, and having vintage scales on display, which can transform the feel of the space without having a decorate at all. I found that soft lighting wasn't always readily available in the rented properties I've lived in, so table or floor lamps can add an often much-needed cosy atmosphere to a room. I've also put some fairy lights into a lantern to add some ambience. A floor lamp is always a great way of creating some additional mood lighting in a room - and you can often pick up some for less than £20 from places like Ikea. A lovely fresh set of sheets can make all the difference when trying to create a bedroom you love. Places like Asda and Primark sell some really pretty duvet sets for little more than a tenner (I still use this one in our spare room) and some carefully placed complementary cushions can really finish off this look. Rented properties can often suffer from lots of bare walls, and if your landlords are anything like mine were, aren't too happy for tenants to fill them up with pictures/posters/photos. While nails/blue tac/sellotape can sometimes be a worry for the paintwork I found picture hooks were a much better idea. Obviously check with your landlord beforehand, but we were able to put up prints and even a mini gallery wall with them. This is the one we have in our current home, put up using picture hooks, and command strips are also an amazing way of displaying artwork on your walls. 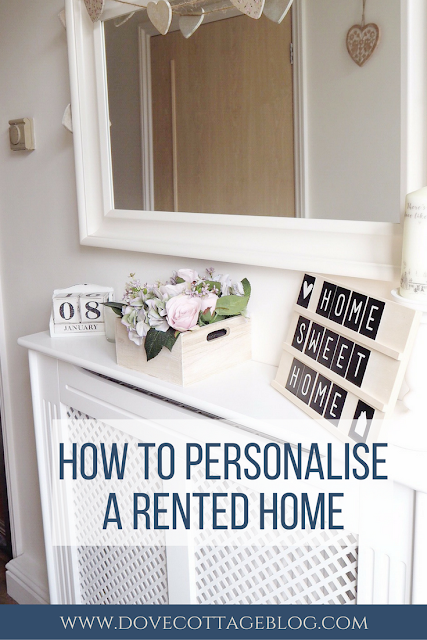 Hope this has been helpful, what are your tips for decorating a rented property?